The American Heart Association (AHA) recently published an analysis of 40 years of research around all methods for lowering blood pressure. Their conclusion on meditation techniques was that TM was the only technique for which a real effect could be demonstrated. In their publication they therefore gave the green light to doctors to use TM as a method of clinical treatment for High Blood Pressure. 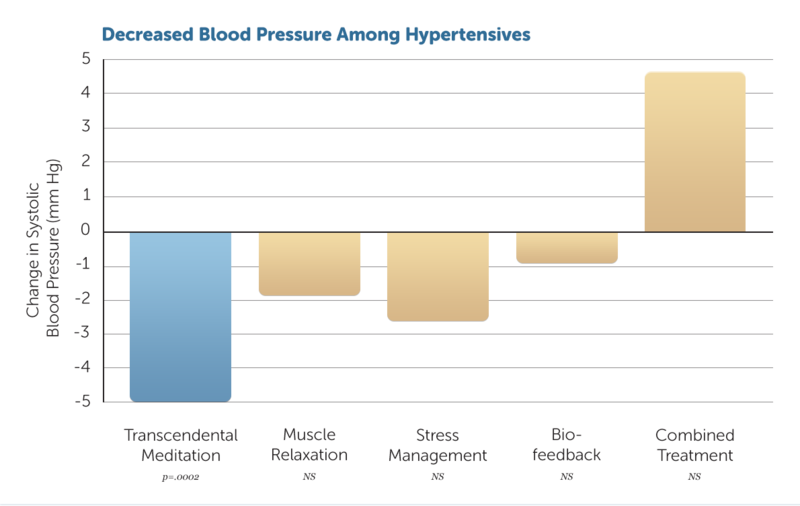 All other meditation and relaxation techniques, including Mindfulness and Yoga, were not recommended, as there was no scientific proof that these had a positive effect on blood pressure. Medication can lower blood pressure, but is can be costly and may have all kinds of adverse side-effects. Moreover, it often only suppresses the symptoms, without really solving the problem. From the moment medication is stopped, blood pressure usually increases again. However, transcending turns out to have a long-term effect. By bringing the individual back to him/her self and giving the body a chance to heal itself, all aspects of life improve; health, well-being, relationships, success and even society as a whole. 1. It demonstrates a significient effect, as hypertension is difficult to heal. 2. This effect is confirmed through several studies of high quality. The National Institutes of Health (NIH) is a research institute of the American government known for its high research standards. Despite them being selective about the research projects they support, they have spent over 24 million USD in support of research on the effect of Transcendental Meditation on the biggest risk factors for cardiovascular diseases: high blood pressure, insulin resistance and atherosclerosis. The reason: Transcendental Meditation really works. TM turns out to be the most successful alternative treatment that works. The Transcendental Meditation technique turns out to be by far, the only alternative treatment that works. 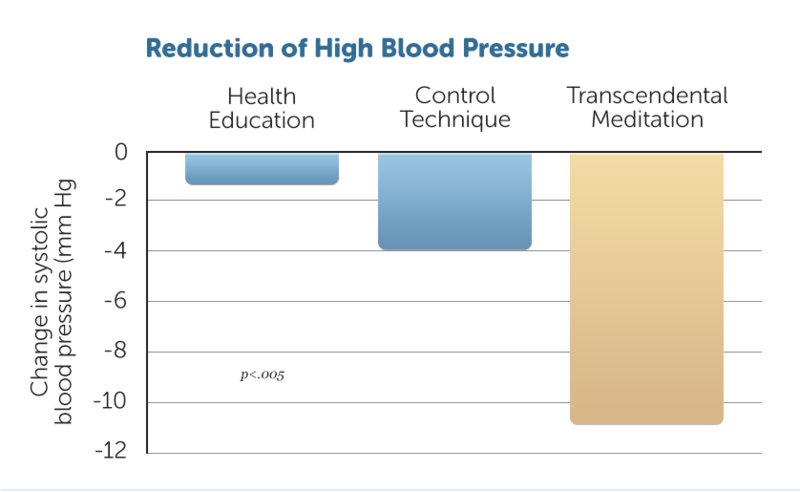 This effect is not as a large as in the previous study, because most TM studies are carried out with individuals with mild hypertension, whereas in the previous study blood pressure was very high at the start of the study. The red line in most TM studies is that the more the patient requires it, the bigger the effect. Transcendental Meditation has a balancing effect on the entire nervous system, and the more the system is out of balance, the bigger the normalising effect. – TM also works to reverse hypertension in younger people. The NIH research has led to Dr. Mehmet Oz, America’s most famous doctor and currently possibly the most influential heart-specialist in the world, fully supports the Transcendental Meditation technique in his TV programme. In his presentation Dr. Oz discusses the effect of TM on 3 big risk factors for heart problems: (1) high blood pressure, (2) high cholesterol and (3) diabetes.